1 year for $34.95 includes your FREE issue (13 issues total) + 1 FREE Bonus Report: The Joy of Conservatism. 2 years for $58.95 includes your FREE issue (25 issues total) + 1 FREE Bonus Report: The Joy of Conservatism. An email address is required for order confirmation. Yes, and I'm subscribing too. From time to time we have the opportunity to provide emails to vendors offering related products and/or services. Many of our readers find this beneficial. To respect your privacy, we ask your permission at this time to include your email on those occasions. If you select NO, we will never provide your email to outside service providers. The first monthly issue will be mailed in 3 to 4 weeks. The Bonus Report will mail with the first issue. You will receive a confirmation email from us momentarily to confirm your order. If you do not receive your confirmation email, please contact us at memberservice@rushlimbaugh.com. For questions about your order or subscription, please call 1-800-829-5386 or write us at The Limbaugh Letter, P.O. Box 420058, Palm Coast, FL 32142-0058. Offer valid in the U.S., its possessions and territories. 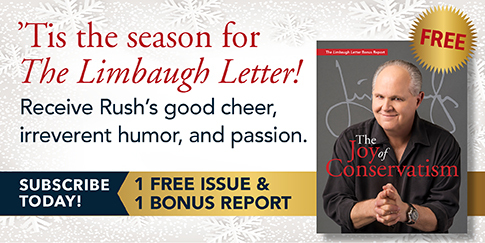 The digital edition of The Limbaugh Letter is available worldwide, including Canada.